There was a lot of noise since Time magazine ran a story on and around Dr. Manmohan Singh in their latest Asian edition. Noise was from all quarters. While Congress and their allies were fervently opposing the actuality of the content, BJP on the other hand were all over the place claiming their stand of accusing Dr. Singh as an effective less and weak Prime minister is vindicated. Noise was also from the so called critics and experts, which also includes the entrepreneur group. While views were divided on what Time magazine has to say in its entirety, a subtle whispering was evident among the voices that what Time magazine has to say on the performance, efficiency or even authority of our Prime minister dealing with various aspects of governance is not entirely wrong either. That itself is scary. Isn’t it? The so called world’s largest democracy and one of the fastest growing economy of the world is having a CEO who is not only inefficient to be on that post but also has no authority or intent to set things right either. Even if we take 20% of the facts scribed in the Time magazine are to be true, it still remains more than just scary. I am not here to furnish statistics to either corroborate Time magazine’s claim or go against them. That is the job of the experts and people with similar sounding job description. As it is, there were a whole lot of statistics already thrown at us by various stake holders all through the day in many discussion forums of our TV debates. I am rather here to narrate my perspective, the perspective of a common layman like me and million others and why one should agree to a large extent on the views that Time magazine carry on our governance, policy frameworks, corruption and our Prime minister as well. Let’s look at our development index of last two years to start with. For me, it always was the economic freedom that defines the growth. Growth is not necessarily only building flyovers, malls or hospitals. Growth is the capabilities of individuals to use them as well. No? If people to large extent remain unable to take benefits from the infrastructural growth, it no more remains growth but paranoia wherein in realty we are bringing up white elephants as potential liabilities for the future. Have the so called growth brought any relief for the citizens? Does this growth have made people enjoy some kind of economic freedom? Certainly not. For almost last couple of years, the backbreaking double digit inflation has emerged as the biggest challenge for an average individual to cope with. Food inflation has reached such proportions that the age old saying of Roti-Daal as the stable and bare minimum food habit of the common populace is coming with a premium. I am not an economist but still struggle to fathom the claim of our politicians that the infrastructure growth in coming up with international standard structures or the ever expanding metro rail network across the nation is helping the growth of the individuals. While people are getting poorer by the day and our investments vanishing quicker than our worries after using Sani Subh Yantra; the touting of a false growth on the backbone of some bizarre claim of infrastructural development is as hilarious as Mayawati getting the clean chit on disproportionate asset case. And what we hear from the people in power, including our Prime minister on the issue of inflation? I don’t want to sound like one Sunny Deol, but in fact we are getting one new date for the expected date of improvement every time. Be it our finance minister or our planning commission head, it always is a new date in offer than letting us know the steps they are assuming before coming up with such dates. Unfortunately, even our Prime minister on whom the Time magazine was so critical follows the suite and furnishes his own set of dates like a headless chicken. So how does for a person who can’t feed his children properly which he could do with the same amount a couple of years back, the rampant development of international quality structures matter? If someone can answer this simple query of mine, I agree to believe, coming up with thousand crores water leaking stuff like T3 terminals is the symbol of real growth syndrome. I heard someone from the Congress camp making tall claims of education and healthcare growth as the indexes where Time magazine was unfair in questioning Manmohan Singh’s government with all probability of missing the point by a galaxy length may be. Let me confess, I am still indecisive on whether to laugh or cry. Sorry to furnish some statistics but before anything the gentleman in discussion must be aware of the 40% kids who are still far from being anywhere near a school or the 20% of those who beg on the streets to earn that much needed next bite of bread. Least talked about the healthcare scenario in our country is better. If numbers are matched up, we shouldn’t at all be surprised if we find amongst countries with highest percentage of infant mortality and pregnant women deaths. While countries like Afghanistan have shown some improvement in terms of human index we have in other hand fallen to a dismal 1.35 on the international scale. The global hunger index is another thing which should make us hang our heads with shame. One of my articles dealing with a hungry India could be found here. For a gist – we are the largest contributor of hungry people (400 million of them) in the world with an embarrassing progress report even worse than Pakistan, Nepal, Burma and North Korea and a little better than Somalia and Haiti. And all this has happened in last four to five years at the maximum where we had the same gentleman as our Prime minister on whom at least the Time magazine is grossly disappointed. 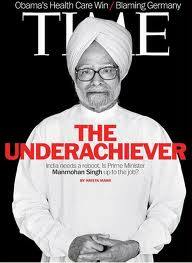 Corruption is another thing for which Time magazine has come heavily on Manmohan Singh and very rightly so. While in all probability the number of corrupt has long surpassed the number of honest amongst our citizenry, our government’s attempt at fixing this cancer is anything but noncommittal. Even though there are millions of reasons for such non-action, the biggest of them is because large chunks that are corrupt are part of the present UPA coalition. Indifference towards the public outcry is expected since any action against the thugs, I am sure would leave half of UPA constituents behind bars within hours. Time and again honest people like Anna Hazare or Arvind Kejriwal were been subjected to unethical treatment to malign their image so that the corrupt and looters of the ruling coalition are left untouched. Even the attempt at hoodwinking an entire nation with false promises was exercised, led by none other than our Prime minister. He himself many-a-times promised the nation of some swift action against the corrupt while in realty he did nothing but supplied enough excuses like coalition compulsion and some other similar sounding nonsense. People like Raja, Kalmadi and Kanimozhi were easily let off the hook so systematically while our Prime minister remained as spineless as an average crawling reptile. When the biggest concern of foreign investors remained the rampant corruption and the corrupt in our country and that too many in his own ranks, our Prime minister conveniently turned ostrich on such burning concerns. The rarest of rare time when our prime minister finally tried to do something he was promptly arm-twisted by his own allies to do exactly opposite to what he has promised the nation. Be it Mamata or the left, it always has been the lesser partner had their way by hook-or-crook. Nepotism and aapsi-bhagidari has made one hell of an impact on our global image where one finds corrupts and thugs ruling the roost while there is an absolute policy paralysis, thanks to some nasty daylight blackmailing. So where are the symptoms for one to go against Time magazine and question their findings? Is there any? Congress stooges can cry atop Mount Everest but the realty which all of us know is painful, horrid and stinks like a gutter. Where is the points for the debate to even build up a case to defend our prime minister against a magazine which is been even termed as the new age East-India company by many whom can’t easily digest the bitter truth. And the truth is we in fact are led by a coalition which is more corrupt than any democratically elected government of the history, which in turn is led by a gentleman who is as power less and clueless as a toddler. By the way, since Time is done away with NaMo and Manmohan Singh, the next bomb I expect them to drop in the Congress camp is by publishing a factual article on another over hyped and brainless character. The prince and the heir apparent, that is. Nice article Boss. Hope Manmohan Sing reads this some day. MMS will write a book and make tons of money after he's done with his regime. The issue is with our people. We've 'Chalta Hai' attitude and lack patriotism. Ask people to watch Cricket, they'll happily do it. Ask them to vote. They say ' we don't care'. How can you expect the system to mature when illiterates vote. I doubt we'll ever get out of the ignorance unless we give up ' What's in for me'. I thought you would comment on the fact that when a white magazine writes about us we respond.... and get worked up etc... the colonized mind and all that. Are we still looking for approval from the whites?